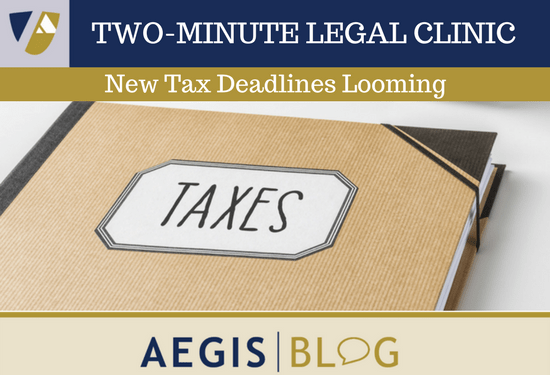 Watch out for these new tax deadlines! For calendar year S corporations and partnerships, the deadline to file IRS Form 1120-S and 1065 returns has been accelerated from April 15 to March 15 for tax years beginning on and after January 1, 2016. That’s right, this year. This is as a result of amendments to IRC 6072(b) under the Surface Transportation and Veterans Health Care Choice Improvement Act of 2015 (P.L. 114-41, for those interested). The change is designed to give S corporation shareholders and partners additional time to prepare individual income tax returns, generally due on April 15 of each year. Conversely, the general due date for a C corporation return has been extended from March 15 to April 15. The deadline to furnish Schedule K-1 forms to an S shareholder or partner is generally the due date of the return. Note that any S corporation or partnership may take a six (6) month extension to September 15 to file its return. (The prior law extension period was only five months because of the later original filing date of April 15.) As with prior laws, however, the extension of the due date for the S corporation or partnership return does not extend the time to file individual returns or to make timely estimated tax payments. AEGIS Professional Services encourages businesses to contact their tax providers or Norman S. Newmark of the firm’s tax department for more information.